U.S. solar industry: Lots of energy, not many panels. America has emerged as the third-largest market for solar, with installers carpeting the nation’s deserts, parking lots, and rooftops with panels. The solar industry is positively booming in the U.S. 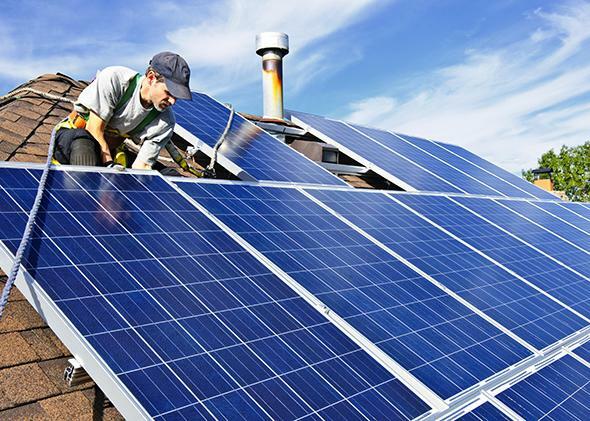 The annual installation of solar systems rose from 1.265 megawatts in 2008 to 4.75 gigawatts in 2013. From nowhere, America has emerged as the third-largest market for solar. Installers are carpeting the nation’s deserts, parking lots, and rooftops with polysilicon panels that convert sunlight into electrons. While the U.S. is manufacturing a lot of solar energy, production of solar panels has been another story entirely. The two biggest solar panel manufacturers headquartered in the U.S., First Solar and SunPower, have located most of their manufacturing capacity in Southeast Asia. Many recent startups have gone kaput, including Solyndra, which became a poster child for government-subsidized failure. In January, Sharp Solar said it would stop manufacturing solar panels in Memphis, Tennessee. And the largest producer of panels in the U.S.—SolarWorld—is actually based in Freiberg, Germany. “We’re really the only manufacturer of any kind of size,” said Ben Santarris, director of strategic affairs at SolarWorld, which has about 500 megawatts of manufacturing capacity in Oregon. But this summer, there have been several augurs of change. First, in June, SolarCity, the solar-leasing company backed by Elon Musk, agreed to buy Silevo, which currently produces solar panels in China. Together, the two firms plan to build a massive factory in Buffalo, New York. “At a targeted capacity greater than 1 GW within the next two years, it will be one of the single largest solar panel production plants in the world,” SolarCity announced. Meanwhile, 1366, a startup based in Bedford, Massachusetts, has raised $64 million to make solar wafers, a component of solar cells. Later this year, it plans to announce the U.S. location of a large factory. Second, on July 22, Suniva, the second-largest manufacturer of panels in the U.S., stated it would double in size by opening a new factory in Saginaw Township, Michigan. Backed by private equity investors and based on technology that emerged from Georgia Tech, six-year-old Suniva operates a factory in Norcross, Georgia, where 300 employees can produce 170 megawatts of modules annually. The Michigan plant, which will be up and running later this year, will have a capacity of 200 megawatts and require 350 new employees. And most recently, on July 23, as Solar Industry magazine noted, tiny Andalay Solar announced it would sell American-made modules, to be manufactured in San Jose, California. These announcements roughly coincided with tentative actions from the U.S. government. Responding to complaints from SolarWorld, the Commerce Department in June and July made formal preliminary determinations that China illegally subsidized its solar panel industry and indicated that it may impose tariffs on panels made in China that could add up to 35 percent to the cost of the products. As is the case in so many other areas, U.S. purchasers of solar panels have been historically unconcerned with the provenance of the product. Solar installation—the so-called downstream part of the market—has been booming, and installers typically seek the cheapest possible panels. “Most people invest in solar for financial reasons,” SolarWorld’s Santarris says. Until recently, that made it a no-brainer to buy panels from China or elsewhere in Asia. But China’s cost advantage is eroding. In addition to seeking relief from the government, U.S.-based manufacturers have responded to competition by ramping up volume (which tends to bring down costs) and investing in efficiency and automation. Companies have to wait several weeks to receive goods ordered from China (which ties up lots of capital), wages are rising in China at a 10-15 percent annual clip, and U.S. manufacturers tend to have a better quality record. “As China continues to mature, manufacturing there just isn’t as cheap,” says Matt Card, vice president of global sales and marketing at Suniva. Industry experts say panels produced in the U.S. can cost only 10 percent more than panels made in China. Of course, a few announcements don’t make for a full-fledged renaissance. And the U.S. still accounts for only a tiny sliver of global module manufacturing. But in a rising number of instances—and especially if the tariffs remain in place—the scales may weigh in favor of U.S.-manufactured panels. Suniva’s move to add a 200-megawatt factory will instantly add about 20 percent to the industry’s productive capacity. If SolarCity follows through with its plans, America’s panel manufacturing capacity will essentially double.